BrainFizz - Routing, Making, Custom projects & Training. 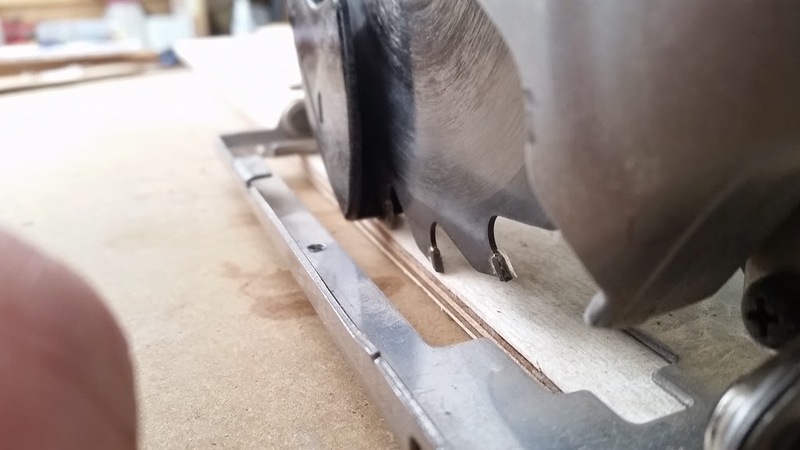 : Improving speed and accuracy of the circular saw: The DIY Track saw upgrade! I retook the key measurements so it all matches and had my supplier cut the bulk of the MDF material to size, and started on the build. Doing it this way meant that the majority of my cuts would be done on the mitre saw, and make things quick and easy on site. The tops needed to be hinged to create storage under each seat, and I've always found it easier to fit the top pieces complete, then mark the places for the cuts and just run the skill saw where needed. If you've ever tried to run a Circular saw free hand along a length you'll know it's a bit of an art, and although perfectly possible, it's far better to use a guide. I carry two aluminium guides on the van for just this purpose, but it always slows me down having to constantly re measure the onset of the base for the saw, to get the cut where I want. So I grabbed a scrap of plywood from the rubbish, and screwed a track to it, and made the cut: Instant zero clearance, zero measure, zero think guide. The biggest problem was it was a little slippy on the smooth faced MDF, A piece of 180 grit sand paper soon stopped the slide, and it was full steam ahead. Once the job was finished I decided that a better, more permanent, "temporary" solution was required. With the small strip in place, the guide is wider than the saw. Making the actual track/guide is simple and there are loads of detailed Youtube videos on making these, but basically it's a thin strip of sheet material like ply or MDF glued onto a wider piece of the same thing as per the photo. 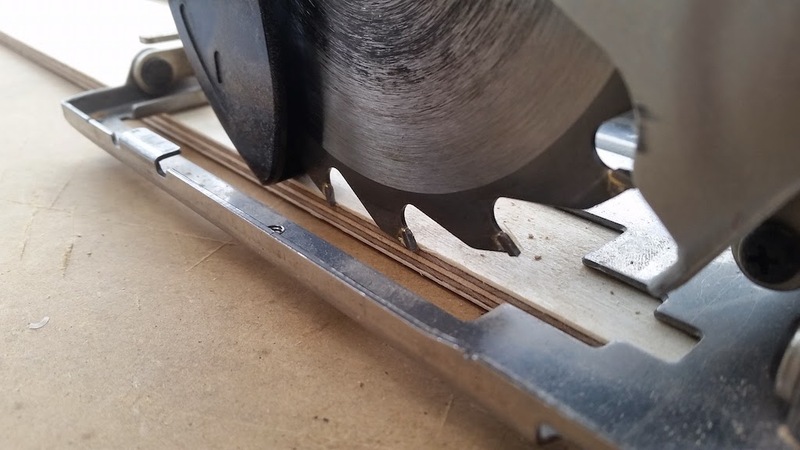 The trick is to make the edge of the wider piece further from the thin piece than the distance of your saws blade is from the edge of the sole, then cut it through to make it the same. With a quick pass of the saw, the guide is ripped creating a "zero clearance" width indication where this saw will cut. The one thing these all suffer from is that they all require clamping to the work. If you take a look at the festool system, you can use it clamp free, as the have non-slip strips on the under side. this was what I wanted - measure where the cut goes, put the track on and cut. 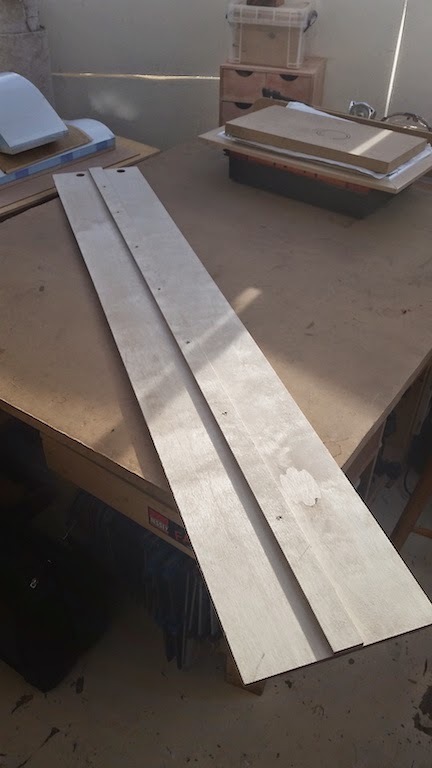 I made the guide rail/track from 6mm Birch ply, as I had some sheets 4' long, ripped two strips. 1 at 8", 1 at about 1 1/2". 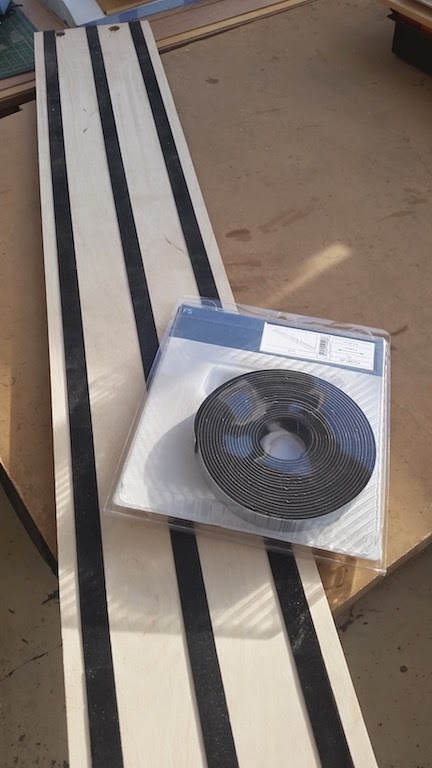 I had a look around and found that festool sell the rubber strip for the tracks as spares in a 10m roll, and even better, it has a self adhesive backing. I found the best price, and went ahead and got some. It's about 2mm thick, so I decided to route channels about 1mm deep in the underside of the ply to reduce the amount it stood off the work, as it means when working the strips are compressed slightly and the whole thing sits more or less flat on the work. Also when I stuck the strips down I stretched ever so slightly reducing it's thickness still further. 3 strips is more than adequate, and leaves me with plenty of spare. Now I basically have a quick and easy way to cut sheet goods down for projects and site work. Not only does it make thinks faster, but more accurate - in terms of less mistakes due to miss measured offsets. It's already served as a speedy method to trim the bottoms of doors when carpet has been re-fitted. The total cost is less than £16, for the non-slip strip which can be bought HERE and HERE in the UK or HERE if your in the US, but you get free shipping. This system works really well, as I already said, and only took about 30 minutes to make including routing the trenches/dados and waiting for the glue to dry. But I already have plans to improve on it, and have already made a UHMW zero clearance sole for the Circular saw this works with - so more on that soon! And don't forget to comment and share, every share helps this creator!